Even when police interrogators left the room, cameras kept recording the teenage suspects. Some paced. Several curled up and slept. One sobbed loudly, hitting his head against the wall, berating himself. Two boys, left alone together, discussed their offense, joking. What none did, however, was exercise his constitutional rights. It was not clear whether the youths even understood them. Therefore none had a lawyer at his side. None left, though all were free to do so, and none remained silent. Some 37 percent made full confessions, and 31 percent made incriminating statements. These were among the observations in a recent study of 57 videotaped interrogations of teenagers, ages 13 to 17, from 17 police departments around the country. The research, published in Law and Human Behavior, adds to accumulating evidence that teenagers are psychologically vulnerable at the gateway to the criminal justice system. Youths, some researchers say, merit special protections. According to federal statistics, nearly 1.5 million teenagers were arrested in 2011, the last year for which data was collected. “If kids are making these poor decisions because their development is not complete, then to penalize them with long-term legal consequences is unfair,” said the study’s author, Hayley M.D. Cleary, an assistant professor at Virginia Commonwealth University and a developmental psychologist specializing in adolescents and the law. Research about adolescents during interrogations is usually drawn from laboratory experiments, surveys or court records. Only a few researchers have had access to actual encounters, typically from one state. Dr. Cleary’s study is the first to examine interrogations from a variety of jurisdictions. The sample, however, is small and limited to agencies that willingly provided videos. One reason the researchers focused on interrogations is that jurors find confessions highly persuasive. But the validity of a juvenile’s confession can be questionable. Was it given voluntarily, with the teenager really grasping the consequences of admitting the crime? Was it true? Teenagers, studies show, are not developmentally ready to make critical decisions that have long-term impacts. “Adolescents are more oriented to the present, so they are less likely than adults to be thinking about the future consequences of what they’re saying,” said Laurence Steinberg, a professor of psychology at Temple University who writes about teenagers in the justice system and was not involved in this study. Teenagers, he added, are also less likely than adults to know that the police can lie during interrogations. Moreover, research shows that teenagers aged 15 and younger will unwittingly comply with authority figures. They are very suggestible, so that during an interrogation, they are more likely than adults to change their answers in response to interviewers. In Dr. Cleary’s study, the average age of the juveniles, almost all boys, was about 15. In nearly every interview, the door was shut to the interrogation room, with the suspect sitting in a corner and the interrogator between the youth and the door. In half the cases, the interrogator had a visible weapon. In 16 percent, the suspects were handcuffed or in leg shackles. The interrogations were frequently interrupted, with other interviewers coming and going. The teenager often was left alone. One interrogator came and went 19 times. Dr. Cleary speculated that interruptions could heighten a suspect’s anxiety but they could also afford him mental breaks. A significant concern about interrogations of juveniles has been their limited capacity to comprehend rights such as the Miranda warnings. Dr. Steinberg once asked a 12-year-old about the right to remain silent. In his new book, “Age of Opportunity: Lessons From the New Science of Adolescence,” he recounts how the boy, who recognized the Miranda warnings from watching “Law & Order,” replied: “It means that you don’t have to say anything until the police officer asks you a question.” Some jurisdictions require that parents be present for interrogations of teenagers. In Dr. Cleary’s study, only 12 suspects were accompanied by parents during portions of the interviews, whose duration ranged from six minutes to five hours, with the average about 45 minutes. But if parents are not legally savvy, their presence may not serve young suspects well. In the videos, five parents remained largely silent. Some lectured their children and then questioned them, taking on the interrogator’s role. A few parents urged their children to come clean, inadvertently sealing their fate. Parents have conflicting roles, Dr. Cleary said. “They want to defend their children against accusations of wrongdoing. But we also socialize children to obey the law and tell the truth. “Some parents might have felt compelled to use the situation as a teachable moment, or they might have felt their parenting skills were being threatened.” Dr. Cleary said. “It’s not fair to put parents in that situation, particularly without a lawyer.”But how do parents balance encouraging children to respect authority against the harm that can befall them by speaking with interrogators? Dr. Steinberg suggests that parents tell teenagers: “If you’re being questioned by police because they think you’ve done something bad, say you need to talk to your parents first.” Parents can decide whether to call a lawyer. 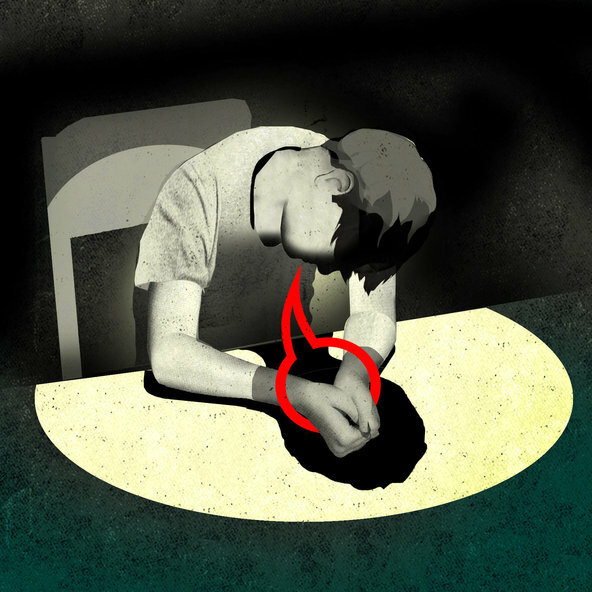 Citing recent research, the American Psychological Association has called for widespread protections for suspects, including teenagers, during interrogations. The recommendations include limiting the length of interviews; videotaping them in their entirety; assuring that teenagers are always accompanied by a lawyer; and that interviewers be trained to reduce the risk of eliciting false confessions from impressionable suspects such as youths. This spring, the International Association of Chiefs of Police, a law enforcement coalition, along with the federal Office of Juvenile Justice and Delinquency Prevention, developed online training for those who interview adolescents. Drawing from developmental research, the program instructs officers to explain Miranda warnings in language teenagers will understand and not to make false promises of leniency, because of youths’ proclivity toward gullibility.